The hologenome concept proposes that microbes and their host organism are an independent unit of selection. Motivated by this concept, we hypothesized that thermal acclimation in poikilothermic organisms, owing to their inability to maintain their body temperature, is connected to their microbiome composition. To test this hypothesis, we used a unique experimental setup with a transgenerational selective breeding scheme for cold tolerance in tropical tilapias. We tested the effects of the selection on the gut microbiome and on host transcriptomic response. Interestingly, we found that host genetic selection for thermal tolerance shapes the microbiome composition and its response to cold. The microbiomes of cold-resistant fish showed higher resilience to temperature changes, indicating that the microbiome is shaped by its host's selection. These findings are consistent with the hologenome concept and highlight the connection between the host and its microbiome's response to the environment. Animals and plants host diverse microbial communities that are vital for their survival. In fact, the host organisms and their associated ‘microbiome’ are so closely linked that they are often described as a single entity: the holobiont unit. This suggests that when the host adapts to cope with stressful conditions, similar changes should also occur in its microbiome. Fish are unable to maintain a stable body temperature and can be greatly affected by temperature fluctuations. Some fish are better able to tolerate cold conditions than others, but it was not known if their gut microbes are similarly affected by changes in temperature. To investigate, Kokou et al. selectively bred tropical blue tilapia to create families of fish that could either tolerate the cold well, or that were highly sensitive to the cold. The gut microbiomes of cold-resistant fish were different from the cold-sensitive ones, even though the fish lived in the same tank. 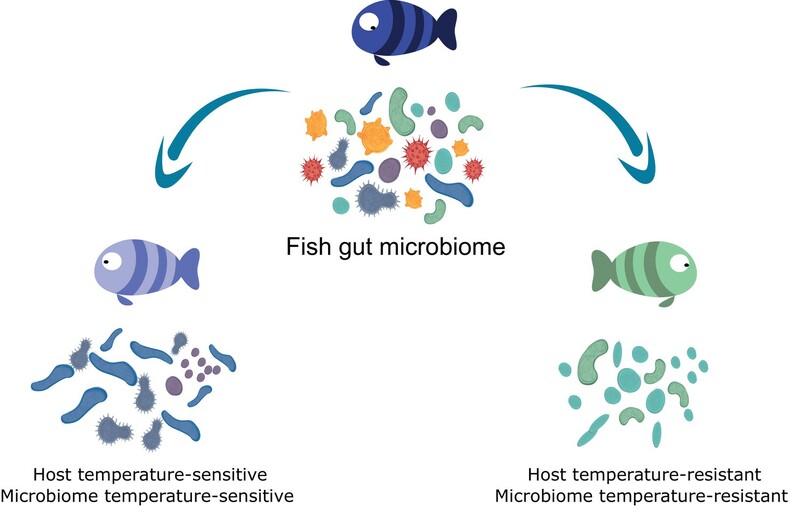 Moreover, the gut microbiomes of the cold-tolerant fish showed higher resilience to temperature changes than the microbes in the guts of the cold-sensitive fish. It remains to be determined whether the response of the microbiome directly affects how its host fish responds to temperature changes. However, the results presented by Kokou et al. show that there are links between how the host and its microbes adapt to environmental stress. As well as helping us to understand how holobionts evolved, this knowledge could also potentially be applied broadly in clinical sciences or agriculture, for example to select for efficient crops. Cold temperature is an environmental challenge that greatly affects metabolic and physiological processes. Thus, adaptations to temperature fluctuations are expected to be found across all organisms. When exposed to cold temperatures, animals undergo remarkable physiological adjustments in order to maintain homeostasis. Such adjustments may occur through genetic and/or non-genetic mechanisms that increase their fitness. Recent work in mice revealed that the gut microbiome facilitates key adaptations during cold exposure by promoting energy demand-driven regulation (Chevalier et al., 2015; Rosenberg and Zilber-Rosenberg, 2018). This is not surprising, as many studies have already proven the vital importance of gut microbial communities for host survival, homeostasis, development and functioning (McFall-Ngai et al., 2013; Shabat et al., 2016). In fact, the universality of host–microbe associations, either transient or tight, inspired the hologenome concept (Bordenstein and Theis, 2015; Brucker and Bordenstein, 2013; Rosenberg and Zilber-Rosenberg, 2013; Rosenberg and Zilber-Rosenberg, 2016; Rosenberg and Zilber-Rosenberg, 2018; Theis et al., 2016), which proposes that within the holobiont, units at different levels, such as genes, chromosomes or biont combinations (i.e., host and microbes), are subject to selection or neutrality. Within this concept, host–microbe interactions have an important role in the host's physiology, whilst microbiome composition may be affected by host selection. Taking this into account, we hypothesized that host selection may facilitate changes in the host-associated microbial species and in their response to environmental selection pressure. Poikilothermic organisms, such as fish, must develop strategies to maintain homeostasis within diverse temperature gradients because environmental temperature changes would otherwise disrupt homeostasis and cause deleterious effects on vital physiological functions (Guschina and Harwood, 2006; Vinagre et al., 2012). The physiological response to stress may vary among populations or individuals and can be affected by various factors (Nitzan et al., 2016; Somero, 2010). Microbial communities in aquatic environments have also been reported to be affected by abiotic factors that act as a habitat-filtering force, such as temperature (Fuhrman et al., 2008). In poikilothermic organisms, the gut microbiome experiences temperature fluctuations that do not exist in homeotherms. There is evidence of a temperature effect on the microbial dynamics associated with invertebrate species (Beleneva and Zhukova, 2009; Carlos et al., 2013; Erwin et al., 2012; Lokmer and Mathias Wegner, 2015; Mahalaxmi et al., 2013; Preheim et al., 2011; Zurel et al., 2011), but such information is largely missing for aquatic poikilothermic vertebrates. Taking the hologenome concept into account, we asked whether host transgenerational selection for thermal tolerance, which is instrumental to poikilothermic organisms’ fitness, involves the host–gut microbiome axis. More specifically, how does microbiome composition respond to temperature changes and does host tolerance shape this response? Here, we hypothesized that the thermal tolerance of poikilothermic vertebrates affects their associated gut microbial species, as well as the response of these microbes to temperature alterations. We focused specifically on the association of changes in the microbiome with the transgenerational low-temperature response in tropical fish, such as tilapia species. The growth of these fish species is highly affected by temperature; they are subject to growth inhibition and mortality when exposed to low temperatures (Cnaani et al., 2000). However, recent work revealed transgenerational inheritance of cold tolerance in these species (Nitzan et al., 2016). Therefore, we used a unique setup, composed of 66 fish families that are part of a transgenerational selective-breeding scheme for enhanced cold tolerance (Figure 1). In this setup, we chose fish progeny from families with the most extreme phenotypes, selected on the basis of the survival rate of their siblings at low temperatures and characterized as cold-resistant or cold-sensitive. Hence, these fish progenies had never experienced low temperature exposure before they were challenged. We used this setup to understand how selection on host thermal tolerance corresponds to microbiome shifts. Our results suggest that host selection for cold tolerance is followed by changes in the gut microbiome, which are manifested by higher resilience to temperature shifts and which may be a key factor in orchestrating cold acclimation in poikilothermic animals. Selection for cold-adapted individuals on the basis of a breeding scheme. The fish parental lines used in this study originated from an Israeli strain of Oreochromis aureus which was subjected to an ongoing selective breeding program for optimal harvest weight at the Dor Aquaculture Research Station (Zak et al., 2014). Individuals were characterized as cold-resistant or cold-sensitive on the basis of days of survival in low temperatures (<16°C) over the generations. The three most extreme phenotypes (resistant and sensitive) based on their performance at low temperatures were selected and their siblings were transferred to the Agricultural Research Organization (ARO) – Volcani center. These animals were challenged, for the first time, by decreasing water temperature from 24°C to 12°C at a rate of 1 °C/day and then held at 12°C for 2 days before sampling the intestine (for 16S rRNA gene sequencing) and liver (for RNA sequencing) from 7 fish per family (21 fish per tolerance group in each temperature [24°C, control, and 12°C]). We analyzed microbiome populations with respect to two potential habitat-filtering forces: temperature and host thermal tolerance through genetic selection. Temperature is known to affect microbial composition in aquatic habitats and to act as a habitat filter (Fuhrman et al., 2008). There is some limited information on the effect of temperature on the gut microbiome, showing compositional changes in homeotherms (Chevalier et al., 2015). However, such information is largely missing in poikilothermic vertebrates, in which physiology is strongly influenced by environmental temperature. To explore whether the thermal tolerance of poikilothermic vertebrates affects their associated gut microbial species and their response to temperature alterations, we used the blue tilapia, Oreochromis aureus, as our experimental model. The optimal temperatures for this species, similar to those for other tilapiine species, are 24–28°C (Trewavas, 1983), but this species is one of the most cold-tolerant among this group of fish (Cnaani et al., 2000). An ongoing selective-breeding process, which has been running for the past few years in Israel, is aimed at improving growth and cold-tolerance traits in this species (Zak et al., 2014). In a recent study, we found that the fish's tolerance to temperatures below 16°C is transgenerational and potentially connected to maternal effects (Nitzan et al., 2016). Thus, the present study focused on understanding host–microbiome interactions in relation to temperature stress and cold acclimation. To evaluate the responses of the fish that are resistant and sensitive to cold exposure, we challenged a total of 84 fish, sampled at 24°C or 12°C, originating from 3 tilapia families with high tolerance and 3 with low tolerance to cold temperatures (7 fish per family). For our experiments, we chose fish originating from mothers that had the most extreme phenotypes, selected on the basis of their sibling’s survival rate at low temperature, as determined by previous cold-challenge trials (Figure 1; Figure 1—figure supplement 1). All of the fish within each generation were kept in the same tank to eliminate confounding effects. The test groups, consisting of 42 fish each from resistant and sensitive families, were challenged by temperature reduction to 12°C over a period of 2 weeks and compared to a control group, consisting of 42 fish from the same families kept at 24°C. At the end of the temperature-challenge trial, we analyzed the fish gut microbiomes from the test and control groups using 16S rRNA gene sequencing, and we also looked at the host's response using liver transcriptomic analysis (Figure 1). Linear mixed-effects model analysis indicated that temperature was the major factor shaping microbial community diversity and richness within the fish gut (Table 1; FShannon = 46.43, FRichness = 45.79, p = 0.001). Indeed, we found a dramatic decrease (Figure 2Ai; Wilcoxon t-test, two-sided, 95% confidence interval (CI), p = 7.2E-02) in microbial diversity (Shannon index H’) and richness (Figure 2—figure supplement 1; Wilcoxon t-test, two-sided, 95% CI, p = 2.7E-08; Figure 2—figure supplement 2, rarefaction curves) when both groups were exposed to cold temperature. This decrease was in agreement with the low-temperature decrease in the 16S gene copy numbers (real-time PCR; Figure 2—figure supplement 3). Furthermore, the microbial communities in the fish that were subjected to cold temperatures exhibited lower variability in richness between samples, whereas greater individual variation was observed in the high temperature group (Figure 2—figure supplement 1i), suggesting that low-temperature conditions are very selective and potentially constrain microbial communities, decreasing their inter-individual variation. Both temperature and host thermal tolerance have a major effect on shaping microbial communities in the fish gut. (A) (i) Shannon H’ diversity was decreased (Wilcoxon t-test, two-sided, 95% CI), when fish from both groups were exposed to cold conditions (12°C, blue). (ii) However, in control-warm conditions (24°C, pink) sensitive fish (purple) had a greater diversity of species in their gut microbiomes compared to the resistant fish (green) (Wilcoxon t-test, two-sided, 95% CI). 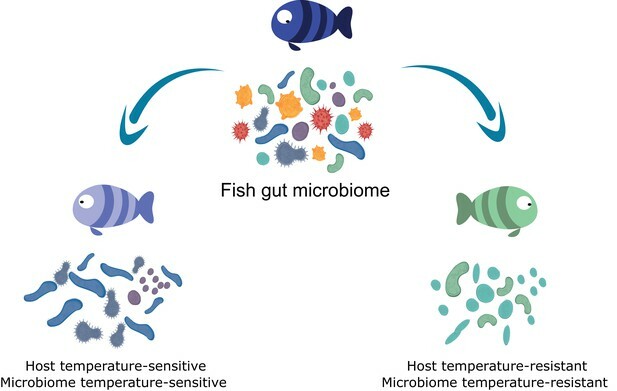 (B) The relative abundance of various orders of microbes in the gut was affected when both resistant and sensitive fish were moved from warm to cold conditions. (C) Comparison of the β-diversity (Bray Curtis) within each of the host groups in (i) warm conditions showed a greater similarity among the resistant individuals compared to that among the sensitive fish, while (ii) comparison in relation to temperature change showed that after exposure to the stressful low-temperature conditions, the microbiomes of cold-resistant fish families were less affected than those of sensitive ones (non-parametric Bonferroni-corrected, using 1000 Monte Carlo permutations). (D) Host-associated species (from indicator species analysis; see 'Materials and methods' section) include several orders that were mostly enriched in either the resistant or the sensitive hosts. (E) (i) Microbial species that were present in >50% of the individuals in both warm and cold conditions (core communities) responded with an increase in their abundance after exposure to cold conditions in the sensitive group, and remained stable in the resistant fish (fold change in abundance from warm to cold shown in (ii)). (iii) These results were also validated by quantitative PCR analysis of the most abundant core species (Pseudomonas veronii and Janthinobacterium lividum). In the box plots, horizontal line in the box represents the median and whiskers indicate the lowest and highest point within 1.5 interquartile ranges of the lower or upper quartile, respectively. Bar plots show the mean copy number per group and whiskers the standard error of the mean. Linear mixed-effects model by restricted maximum likelihood (REML) for temperature and tolerance on richness and diversity. *Statistical significance at p < 0.05. d.f., degrees of freedom; AIC, Akaike information criterion; BIC, Bayesian information criterion; logLik, log of likelihood. Microbial community structure (β-diversity) was also dramatically affected by cold exposure, being the major factor associated with increasing similarity between individuals in the communities (Table 2; FTemperature = 6.5072, p = 0.002), after gut physiology effects (FPart = 28.8936, p = 0.001). Orders from the Proteobacteria phylum, and more specifically Vibrionales and Alteromonadales, were enriched at 12°C (Figure 2B; Supplementary file 1, Table S1; Figure 2—figure supplement 4), with prior studies reporting these taxa's potential for survival in cold temperatures (Lauro et al., 2011; Math et al., 2012; Raymond-Bouchard and Whyte, 2017). Overall, however, as microbial diversity and richness decreased (Figure 2Ai; Figure 2—figure supplement 1i), several microbial phyla, such as Planctomycetes, Bacteroidetes and Verrucomicrobia, were significantly depleted after cold-exposure (Figure 2B; Figure 2—figure supplement 5; Supplementary file 1, Table S1). These findings indicate that in poikilothermic vertebrates such as the blue tilapia, gut microbial communities are strongly affected by environmental temperature. Permanova (Adonis) results for experimental communities based on Bray–Curtis distances. *, **Statistical significance at p < 0.05 and 0.01, respectively. Permutations n = 999. d.f., degrees of freedom; SS, sum of squares; MS, mean sum of squares. After observing a drastic decrease in gut microbial diversity during cold exposure (Figure 2Ai), we sought to evaluate how the host's thermal tolerance affects microbiome composition. Moreover, if host thermal tolerance is connected to cold temperature acclimation, then we would expect the microbiome response to relate to different tolerance phenotypes. We tested this hypothesis by evaluating the response of the cold-sensitive and cold-resistant selected families to the changing environmental conditions. We compared the gut microbial compositions of the sensitive and resistant families and found that host thermal tolerance has a significant effect on gut microbial diversity (Table 2; FTolerance = 2.2269, p = 0.04). Furthermore, we also observed a significant interaction between host thermal tolerance and temperature, indicating a different microbiome response to the lower temperature in the resistant vs. sensitive hosts (FTxT = 3.6113, p = 0.012). Interestingly, when fish from both groups were kept under their optimal temperature conditions of 24°C, the sensitive fish exhibited higher microbial diversity (Shannon H′) than the resistant ones, as well as higher individual variability (Figure 2Aii; Wilcoxon t-test, two-sided, 95% CI, p = 0.048). Indeed, when we compared the β-diversity of the two groups under these optimal conditions, we found that cold-resistant fish had a higher within-group microbiome similarity than the sensitive fish (Figure 2Ci; non-parametric Bonferroni-corrected p = 0.01, using 1000 Monte Carlo permutations), potentially because of the selection process to which resistant fish have been subjected with regard to the cold-resistance trait, thus showing host control of microbiome composition. We further aimed to gain better insight into the microbiome composition of these host groups. We first compared the microbiome composition of cold-resistant and cold-sensitive hosts under each temperature condition; more specifically, we asked whether microbiomes of similar (Shannon H′) diversity also share the same microbiome compositions. To answer this, we stratified our data and examined individuals from each host group with similar Shannon H′ diversity (individuals from each group with the 10 highest or 10 lowest Shannon H′ diversity values; Supplementary file 1, Table S2). We found that the individuals from both high- and low-diversity microbiomes (Principal coordinate analysis; Figure 2—figure supplement 6) clustered significantly according to host group (Permanova analysis; Supplementary file 1, Tables S3 and S4), suggesting that host genetic background (genetic selection for cold tolerance) had a strong effect on shaping the microbiome composition. Our next step was to explore the microbial taxa that are associated with genetic background effects. Indicator species analysis (which identifies habitat-associated species on the basis of their fidelity and relative abundance in different environments; see 'Materials and methods') revealed several microbial taxa that were significantly associated with host genetic background and had been described previously as naturally occurring strains in the tilapia gut (Giatsis et al., 2016; Haygood and Jha, 2016) (Supplementary file 1, Tables S5 and S6; Figure 2—figure supplements 7–8). Taxa including microbial species such as Cetobacterium somerae (Tsuchiya et al., 2008) and species of the order Vibrionales (i.e., Vibrio cholerae; Figure 2—figure supplement 5F), which were also described as microbes surviving in environments with a broad temperature range (Raymond-Bouchard and Whyte, 2017; Townsley et al., 2016), were enriched in the resistant fish gut (Figure 2D; Figure 2—figure supplement 8; Supplementary file 1, Tables S5 and S6). On the other hand, a higher diversity of taxa, including Prevotella sp., Streptococcus luteciae and Bacteroidetes species, as well as species from the families Christensenellaceae, Succinivibrionaceae and Clostridiaceae,was enriched in the sensitive fish gut (Figure 2D; Supplementary file 1, Tables S5 and S6). Altogether, our results indicate that host genetic background shapes microbiome composition by selecting for specific microbes, with some of them potentially carrying fitness traits for low-temperature tolerance. As host fish were specifically selected according to their thermal tolerance, and as our findings indicated that temperature and host genetic background affect the fish gut microbiome, we further asked whether the microbiome's response to temperature stress is also affected by its host's tolerance. When exposed to the cold temperature of 12°C, both resistant and sensitive hosts exhibited a decrease in their microbiome diversity and richness (Figure 2A; Figure 2—figure supplement 1), as well as changes in microbiome composition (Figure 2B; Figure 2—figure supplements 4–8). When we compared the β-diversity within each of these host groups in relation to changing temperature, however, we found that after exposure to the stressful low-temperature conditions, the microbiomes of cold-resistant fish families were less affected than those of sensitive ones (Figure 2Cii; non-parametric Bonferroni-corrected p = 0.02, using 1000 Monte Carlo permutations). More specifically, when we compared the similarity of the microbial compositions between fish at 24°C and 12°C, we found it to be significantly greater in the resistant fish families than in the sensitive ones, showing a stronger effect of temperature change in the sensitive fish (Figure 2Cii). We next asked whether the microbiome's differential response to temperature in the two host groups also applies to microbes that are shared between the two host groups. We assessed microbiome resilience by looking at 11 selected taxa that were present in >50% of the individuals from each temperature environment (the 'core microbiome'). After renormalizing the core microbes' abundance (expressed as percentage within the core microbiome community; Figure 2E), we evaluated the fold changes in the abundance of these taxa upon change from 24°C to 12°C in both the cold-resistant and cold-sensitive fish. Similar to the overall microbiome response (Figure 2Cii), the fold change in the relative abundance of the core microbiome in resistant fish was significantly lower than that in sensitive ones (Figure 2Eii). We further designed specific primers to measure the absolute copy numbers of the two most abundant and prevalent (>95% of the individuals) core taxa (Pseudomonas veronii and Janthinobacterium lividum) in both host groups and quantified their abundance by quantitative PCR (see 'Materials and methods'). Our results were in agreement with the sequencing data (Figure 2Ei, ii), showing a significantly less pronounced temperature effect on the abundance of the core microbes in the gut of the resistant fish compared to that in the gut of the sensitive ones (Figure 2Eiii). These results thus supported our hypothesis that host thermal tolerance modulates the microbiome's response to temperature changes. Since we found that microbiome composition and response to temperature changes are connected to the host's thermal tolerance, we next evaluated the microbial community composition and attributes in relation to temperature and host cold acclimation. We utilized the linear discriminant analysis (LDA) effect size (LEfSe) tool (Segata et al., 2011) and the PICRUSt (Phylogenetic Investigation of Communities by Reconstruction of Unobserved States) tool (Langille et al., 2013). During cold exposure, we found a significant change (enrichment or depletion) in several pathways in all host microbiomes, resistant and sensitive. More specifically, a decrease in the abundance of genes belonging to metabolic pathways was observed, whereas genes in pathways related to cellular processes and signaling increased significantly in abundance (Figure 3A). In line with the changes in microbial composition, the overall fold change in microbial coding capacity between warm and cold temperature was significantly greater in the cold-sensitive fish (Figure 3B; p < 0.0001, Wilcoxon rank-sum test, two-sided), showing a more pronounced response in this group. Specifically, microbiome composition changes resulting from cold exposure seem to relate to functional shifts, which overall correspond to a stress-related response and to cell defense, in line with prior studies suggesting reduction of metabolic activity and transcription, and increases in motility, chemotaxis and membrane transport in response to cold (Nachin et al., 2005). Therefore, host thermal tolerance seems to contribute to and to enhance the differences in microbiome functions with respect to thermal stress, potentially suggesting that not only microbiome composition, but also certain attributes of the microbiome may be influenced by host genetic background and response to low temperatures. Microbial functional diversity corresponds to cold stress and the host's acclimation. (A) Pathway enrichment analysis using PICRUSt-predicted KEGG (Kyoto Encyclopedia of Genes and Genomes) orthologs revealed a decrease in microbiome pathways related to metabolism during cold exposure, with an increase in the number of ortholog groups related to cellular processes, genetic and environmental information and processing. Different pathways were enriched in the resistant and sensitive fish, as indicated by the LEfSe analysis (see 'Materials and methods' section). (B) Differences were observed in the microbiome responses of the cold-resistant and sensitive fish, the latter showing a higher fold change from control when exposed to cold conditions (Wilcoxon rank-sum pairwise test, p < 0.0001, two sided). The bar plots show the mean fold change in abundance of KEGG orthologs in the microbial pathways after temperature change from 24°C to 12°C and whiskers represent the standard error of the mean, as indicated by PICRUSt and LEfSe analysis. (C) Functions that are shared between the microbiome and host response that were affected after cold exposure. Bar plots show fold change in the enrichment of KEGG orthologs after temperature change from 24°C to 12°C. To this point, our findings indicated that selection for host thermal tolerance shapes microbiome composition and response to decreased temperatures. We then asked whether the host response to the change in temperature in the resistant and sensitive families agrees with the microbiome response, as it is known that cold exposure greatly affects metabolic and physiological processes in poikilothermic vertebrates, such as fish, toward maintaining fitness and adaptation (Schulte et al., 2011). Specifically, we asked whether host response in the resistant fish families is more moderate than that in the sensitive families. We sequenced the transcriptome in the liver, which is an important and sensitive organ for stress and immune regulation in fish (Kokou et al., 2016; Möller et al., 2014). In agreement with our findings of a differential microbiome response to cold exposure between the resistant and sensitive fish, the transcriptomic response in the liver showed that the overall fold change in gene expression between warm and cold temperature conditions was significantly higher in the cold-sensitive fish (Figure 4A; p < 0.0001, Wilcoxon rank-sum test, one-sided), showing a more pronounced response in this group. Moreover, when we compared the similarity in the transcript presence/absence patterns of the host response between fish in 24°C and 12°C conditions, we found it to be significantly higher in the resistant families than in the sensitive ones, showing a stronger effect of temperature change in the sensitive fish (Figure 4B; Figure 4—figure supplement 1), as was also the case for the microbiome response (Figure 3B). Similarly, when we analysed the transcriptomic response for host-associated genes (sensitive vs. resistant; see 'Materials and methods'), the response of the resistant hosts to a change in temperature from 24°C to 12°C changed significantly less than that of the sensitive fish (Figure 4C; Figure 4—figure supplement 2). Host–microbiome response during cold exposure indicates a more stable phenotype. (A) Comparison of the average fold change in transcriptome expression per host group in relation to temperature change showed that after exposure to low-temperature conditions, the gene expression of cold-resistant families was less affected than those of sensitive ones (Wilcoxon rank-sum test, p < 0.0001, two-sided). (B) Comparison of the transcriptome β-diversity (Jaccard) in warm and cold conditions within each of the host groups showed a greater similarity among the resistant individuals than among the sensitive ones (Wilcoxon rank-run test, p = 0.008, two-sided). (C) Heatmap showing the expression patterns of host-associated genes as determined by indval analysis (rows) of cold-resistant and cold-sensitive hosts in warm and cold conditions (columns). Genes were annotated in KEGG (Kyoto Encyclopedia of Genes and Genomes). (D) Total fraction of operational taxonomic unit (OTU) variance explained by host genetics on the basis of Canonical Correlation Analysis (CCA) between the matrices of OTUs principal coordinates and transcriptomic data principal coordinates. A significant correlation was found after comparing the posterior gut microbiome structure and the liver transcriptome between the resistant and sensitive fish (Canonical Correlation Analysis, 1000 permutations, actual variance = 0.83, permuted variance = 0.44, p = 0.0044). This actual value was compared to that of 1000 random permutations, where the order of the host lines' principal coordinates was shuffled. To further test such agreement between host and microbiome responses, we compared the posterior gut microbiome structure and the liver transcriptome of resistant and sensitive fish. Specifically, we performed a Principal Component Analysis (PCA) for both the microbiome and transcriptome and we correlated the top five microbiome principal components (PCs) to the top five transcriptome PCs by means of Canonical Correlation Analysis (CCA), which aims to maximize and measure the correlation between two multivariate datasets. Interestingly, the measured correlation coefficient was significant when we compared it to correlation coefficients achieved after randomly shuffling the sample labels (Figure 4B; p = 0.0044). This analysis showed that more than 80% of the variance observed in the microbiome response to temperature could be explained by the variance observed in the transcriptomic response (Figure 4B; actual variance was 83% vs. permuted 44%), thus supporting a host–microbiome interaction in response to environmental changes. Notably, when we looked at the host transcriptome response to cold exposure, we found several metabolic pathways (Figure 3C) that were also affected in the microbiome (Figure 3A), with most of the changes occurring in the same direction (depletion or enrichment). Looking at the functions that are commonly shared between the host and the microbiome response to cold exposure (Figure 3C), we found that some of these functions, namely transcription- and cytochrome P450-related pathways (Figure 3C; Figure 3—figure supplement 1), were also reported as key cell metabolism cold-induced adaptations in homeotherms (Shore et al., 2013). Such findings led us hypothesize that these functions may be conserved with regard to host and gut microbiome responses to temperature changes. Within the hologenome concept, host–microbe interactions are connected and make up a unit of natural selection (Rosenberg and Zilber-Rosenberg, 2013; Rosenberg and Zilber-Rosenberg, 2016; Rosenberg and Zilber-Rosenberg, 2018; Theis et al., 2016). Inspired by this concept, we hypothesized that this association between the host and its microbes may relate to the host's response to environmental changes, such as exposure to low temperature. Cold exposure led to dramatic changes in gut microbiome composition, representing a notable determinant of the microbial communities, by increasing several orders of Proteobacteria (Vibrionales and Alteromonadales) and decreasing all other phyla (Figure 2). In particular, some species of the order Alteromonadales have been shown to facilitate adaptations for survival under different conditions, including low temperatures (Alteromonas [Math et al., 2012]; Shewanella [Abboud et al., 2005]), whereas several Vibrionales species have been found to adapt to low temperatures, such as Vibrio cholerae (Townsley et al., 2016), which was enriched under our cold conditions. These changes in microbial composition also led to a substantial change in the functional profile of the gut microbial communities. Notably, our analysis revealed that pathways related to metabolism were depleted during cold exposure, in both the microbiome and host transcriptomic response (Figure 3; Figure 3—figure supplement 1), whereas KEGG (Kyoto Encyclopedia of Genes and Genomes) orthologs related to cell communication, membrane transport and structure, signaling and cell motility were enriched, indicating a potential overall stress response (Nachin et al., 2005; Tsimring et al., 1995) (Figure 3). Interestingly, such changes have also been associated with ecological fitness traits (i.e., membrane transport, signal-transduction genes, tRNA diversity, carbon metabolism) (Math et al., 2012) that assist in microbial survival strategies during cold adaptation in some Alteromonadales speciesMath et al., 2012. It should be noted that the enrichment of microbial taxonomic groups that are associated with fish hosts and temperature changes, such as the Proteobacteria orders, potentially resulted in the enrichment of functions associated with these taxa, while not necessarily being connected to cold tolerance. However, we did find several of these functions that were not only shared between the host and the microbiome but also similarly affected in the host and microbiome after cold exposure (Figure 3C; Figure 3—figure supplement 1B). Some of the functions were actually previously reported as key cell metabolism cold-induced adaptations in mice (i.e. downregulation of peroxisome proliferator-activated receptor (PPAR) signaling and cytochrome-450-related pathways; [Shore et al., 2013]), thus suggesting a potential conserved response to low temperatures. Motivated by the hologenome concept, we deduced that the microbiome response to low temperatures would also be associated with the host response and would be related to host thermal tolerance. We used two different groups of tilapias originating from mothers with different tolerance to low water temperatures (Nitzan et al., 2016). Interestingly, we found agreement between transcriptomic and microbiome responses to cold exposure, marking a host–microbiome interaction that potentially leads to higher microbiome stability and lower physiological stress in the cold-resistant fish (Figure 4). As these animals originate from different families (crosses) and not from the same population, and were kept under the same experimental conditions (same tanks) across generations, we conclude that this effect originates from differences in the genetic background, thermal tolerance and acclimation of the fish. 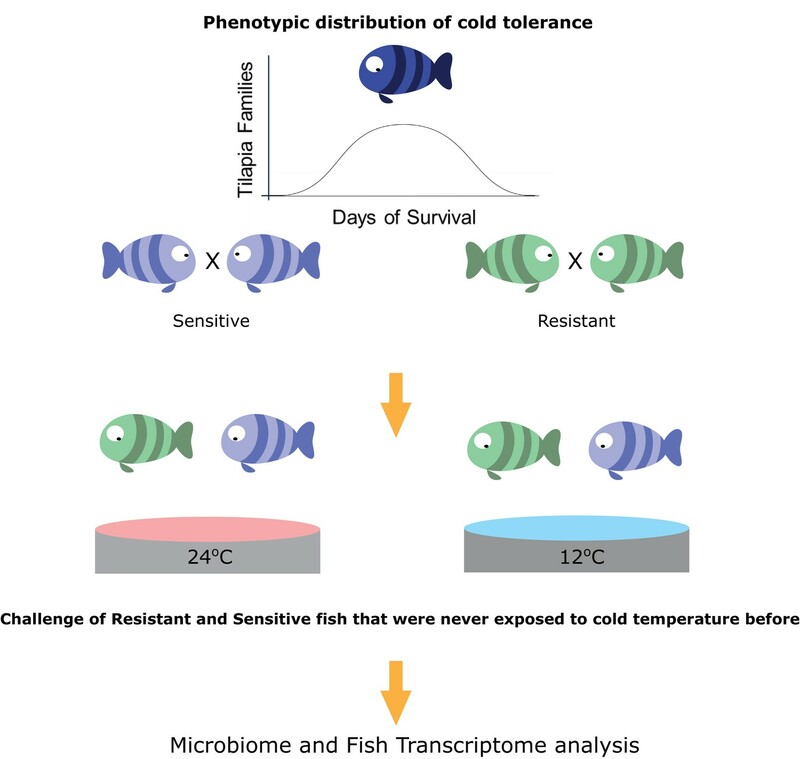 The decrease in microbiome richness and diversity with cold exposure in both resistant and sensitive fish could be explained in terms of selective pressure (Figure 2A). As these fish are poikilothermic organisms, their gut microbiome is directly exposed to water temperature. Warmer temperatures, which are optimal for tilapias, are more permissive and can lead to greater heterogeneity and richness of microbiome composition (Erwin et al., 2012)(Figure 2A,B). Alternatively, a decrease in temperature imposes a selective pressure that reduces microbial diversity, as we observed in both resistant and sensitive fish (Chevalier et al., 2015; Lokmer and Mathias Wegner, 2015). Intriguingly, our findings show host control of microbiome composition and response to temperature differences. Under warm conditions, we found compositional microbiome differences between the two host groups (Figure 2B,C,D), highlighting the importance of host genetic background for microbiome composition. Nonetheless, in the transition to cold temperature, these differences in the microbiome responses in sensitive and resistant fish were manifested at the taxonomic and functional levels (Figure 2B,D,E), through enrichment of taxa with potential ecological fitness traits for cold adaptation or by affecting the cold sensitivity of the core microbial communities to temperature, and thus illustrating that the pre-exposure potential of the gut microbiome is due to host selection. Cold exposure greatly affects metabolic and physiological processes in fish, which undergo several acclimation processes to maintain their fitness. The transcriptomic or physiological responses may include changes in enzymatic activity and efficiency, membrane permeability, and metabolic rate through mitochondrial energy production (Battersby and Moyes, 1998; Itoi et al., 2003), and may vary with the life history or genetic background of the organism. Transcriptomic responses in the blue tilapia liver were in line with the microbiome response to temperature, both in the size of the effect in resistant and sensitive fish (Figure 4; Figure 4—figure supplements 1–2) and in its nature, manifested as changes in functions related to metabolism and signaling (Figure 3—figure supplement 1). Resistant fish seemed to be under lower levels of physiological stress than sensitive fish, and therefore had lower temperature-related metabolic demands. These results could potentially be connected to lower energetic demands for maintaining homeostasis. In fact, it was previously shown that these resistant fish have lower mitochondrial gene expression than their sensitive counterparts (Nitzan et al., 2016). 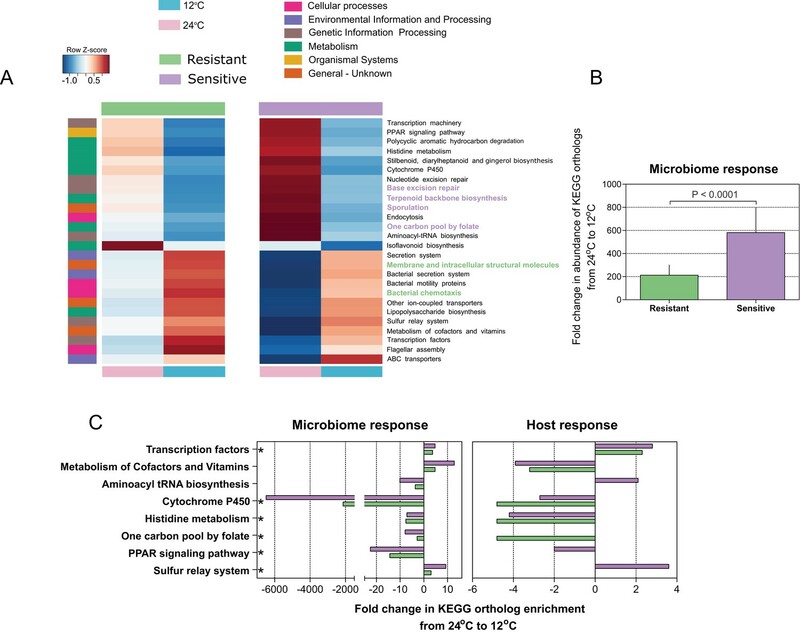 Agreement between host transcriptomic and microbiome response, showing higher stability in the resistant animals compared to the sensitive ones (Figure 4; Figure 4—figure supplements 1–2), supports our hypothesis of host–microbe associations that potentially modulate the acclimation process. Our insight into the microbial dynamics of the blue tilapia gut microbiome in response to environmental conditions shows that temperature, host genetic background and tolerance to thermal stress are major determinants of community structure and dynamics. Microbial community diversity and richness severely decreased during cold exposure; but microbial response was related to host thermal tolerance, which affected microbiome stability (Figure 5). These results indicate that host cold tolerance shapes not only gut microbiome composition but also the sensitivity of core microbial communities to temperature, and that host cold tolerance modulates the thermal acclimation of the gut microbiome. These finding are consistent with the hologenome concept, which proposes that associations exist between the microbes and their hosts, suggesting that together they consist a unit of natural selection. Thus, taking this concept into account, we highlight potential connections between host acclimation and its microbiome response to environmental stress. Host cold-tolerant phenotype selection is accompanied by a cold-tolerant gut microbiome. Three sensitive and three resistant families of blue tilapia (Nitzan et al., 2016), selected for different survival rates during cold exposure (Figure 1—figure supplement 1), were raised at the Dor Aquaculture Research Station, Israel, and transferred to a climate-controlled room in the Institute of Animal Science, Agricultural Research Organization (Rishon LeZion, Israel). Progenies of each mother are termed family in our dataset (we used 6 families in total - 3 resistant and 3 sensitive). Seven fish from each family were cold-challenged by gradual temperature decrease from 24°C to 12°C at a rate of 1 °C/day and then held at 12°C for 2 days, while their full-siblings were maintained at 24°C. No mortality was observed during this period. Liver tissue from three fish per family in each treatment was dissected and kept in Ambion RNAlater buffer at −20°C for transcriptome analysis. In addition, two gut compartments were sampled, the anterior and posterior intestine, from the 21 tolerant and 21 sensitive fish (7 from each family) in each treatment (in total 84 fish in cold and warm conditions; 168 samples from both anterior and posterior intestine). After dissection, the gut parts, including content and mucosa, were removed and the connective tissue cleaned; each sample was then ground, frozen and stored at −80°C for further analysis of microbiome composition. This study was approved by the Agricultural Research Organization Committee for Ethics in Using Experimental Animals and was carried out in compliance with the current laws governing biological research in Israel (Approval number: 146/09IL). Bacterial DNA was isolated from gut samples using the protocol described by Roeselers et al. (2011) with some modifications (Sun et al., 2013). Excised intestines were combined in 2.0 ml screw-cap tubes with 0.5 mm and 1 mm silica beads, 400 ml 50 mM Na-phosphate buffer (pH 8.0) and 200 ml of lysis solution containing 5% w/v sodium dodecyl sulfate, 0.5 M Tris-HCl (pH 8.0) and 0.1 M NaCl. Samples were homogenized in a bead-beater for 5 min on high speed and centrifuged at 16,000 g for 5 min. The supernatant was transferred to new tubes and lysozyme (Sigma, St. Louis, MO) was added to a final concentration of 2 mg/ml followed by incubation at 42°C for 1 hr and then at 37°C for 1 hr. Following this step, the solution was sequentially extracted with TE (10 mM Tris-HCl (pH 8.0) and 1 mM EDTA), saturated phenol, phenol-chloroform (1:1 v/v), and chloroform-isoamyl alcohol (24:1 v/v). Finally, DNA in the aqueous phase was precipitated with 0.1 vol 3 M sodium acetate (pH 5.2) and 0.7 vol isopropanol. The concentration of DNA in the solution was measured using a UV-Vis Spectrophotometer (Thermo Scientific, Waltham, MA) (Cnaani et al., 2000) and stored at −20°C for further analysis. Only samples that resulted in a high yield of quality DNA were used for subsequent analyses. Quantitative real-time PCR analysis was performed to measure the total number of bacteria in the anterior and posterior parts of both resistant and sensitive fish at both temperatures, through amplification of their 16S rRNA gene. Real-time PCR was performed in a 10 µl reaction mixture containing 5 µl Absolute Blue SYBR Green Master Mix (Thermo Scientific), 0.5 µl of each primer (10 mM working concentration; Forward 5’-ACTCCTACGGGAGGCAGC-3’ and Reverse 5’-GTATTACCGCGGCTGCTGGCA-3’), 3 µl nuclease-free water and 2 µl of 100 ng DNA template. Amplification involved one cycle held at 95°C for 15 min for initial denaturation and activation of the hot-start polymerase system, and then 40 cycles at 95°C for 10 s followed by annealing for 15 s at 60°C and extension at 72°C for 20 s. Bacteria were quantified using a standard curve for the 16S rRNA gene at different concentrations (102–108 copies/µl) and the results were expressed as 16S gene copy numbers per microliter. Sequencing of the PCR-amplified V4 region of 16S rRNA was performed using the Next Generation system (Illumina, California, United States) (Kanehisa and Goto, 2000). First, amplification of the V4 region, using primers 515F (5’-GTGCCAGCMGCCGCGGTAA-3’) and 806R (in which each R contained a different 12 bp index), was performed under the following conditions: 94°C for 15 min, followed by 35 cycles of 94°C for 45 s, 50°C for 60 s and 72°C for 90 s, and a final elongation step at 72°C for 10 min. The PCR product (380 bp) was cleaned using DNA Clean and Concentrator (Zymo Research, California, United States) and the fragments containing the Illumina adaptors were quantified. Amplification involved one cycle held at 95°C for 15 min for initial denaturation and then 40 cycles at 95°C for 10 s, followed by annealing at 60°C for 20 s and extension at 72°C for 30 s. The product was quantified using a standard curve with serial DNA concentrations (0.1–10 nM). Finally, the samples were equimolarly diluted to a concentration of 0.4 nM and prepared for sequencing according to the manufacturer’s instructions. An open-source software package, DADA2 (Callahan et al., 2016), was applied to model and correct Illumina-sequenced amplicon errors, following the tutorial suggestions (https://github.com/benjjneb/dada2). DADA2 resolves differences at the single-nucleotide level and the end product is an amplicon sequence variant table, which is a higher-resolution analog of the traditional OTU table, recording the number of times each exact sequence variant (ESV) was observed in each sample (100% sequence identity). Taxonomy was assigned using the Ribosomal Database Project Classifier (Wang et al., 2007) against the 16S gene reference Greengenes database (13.8 version) (McDonald et al., 2012). Owing to the variation in sequence depths between samples, all samples were normalized to the lowest depth by subsampling (6000 read/sample) and sequences that were present in fewer than two samples (doubletons) were discarded from the final table (Beleneva and Zhukova, 2009). Sequences were submitted under the accession number SRP131209 in the Sequence Read Archive (SRA). where IndValij is the indicator value of species 'i' in relation to site type 'j'; Specificityij is the proportion of sites of type 'j' with species 'i', and Fidelityij is the proportion of the number of individuals (abundance) of species 'i' that are in site type 'j'. Core communities were identified as the most resilient microbes present in >50% of the individuals at either 24°C or 12°C. To measure the absolute abundance of the two most prevalent core microbes (Pseudomonas veronii and Janthinobacterium lividum) and to validate our sequencing data, we designed specific primers to amplify their copy numbers using the Primer-BLAST tool (Ye et al., 2012). After validation of the primers, real-time PCR was performed using the specific primers (P. veronii, Forward 5′-CCGCGGTAATACAGAGGGTG-3′ and Reverse 5′-ACCCTCTACCATACTCTAGTCAGT-3′; J. lividum, Forward 5′- CGCAGGCGGTTTTGTAAGTC-3′ and Reverse 5′- GTCAATCTTGACCCAGGGGG-3′). The fold change in abundance of each microbe was calculated relative to that in the warm conditions as the control. To predict the functional content of the gut microbiome originating from the different groups, we used the PICRUSt tool (Langille et al., 2013). PICRUSt (http://picrust.github.com/picrust/) is a software package designed to infer metagenome functional content from 16S metagenomic data. The paired-end merged 16S sequences were used for closed-reference OTU picking using QIIME, and the resulting OTU table was then fed into PICRUSt and functional predictions assigned to KEGG pathways (Kanehisa and Goto, 2000) were made according to the metagenome inference workflow described by the developers. PICRUSt results were normalized, and then analyzed using the LEfSe tool (Segata et al., 2011). LEfSe is an algorithm for high-dimensional biomarker discovery and explanation that identifies genomic features (i.e., taxa) characterizing the differences between two or more biological conditions. It uses statistical significance and biological relevance to identify differentially abundant features, using the non-parametric factorial Kruskal–Wallis rank-sum test and the Wilcoxon rank-sum pairwise test to compare biologically significant categories. Then, it uses LDA to estimate the effect size of each differentially abundant feature and to perform dimension reduction to assess whether the differences are consistent with the expected biological behavior. We thus reanalyzed our sequences using the QIIME closed reference protocol against the 97% similarity to the GreenGenes database. The nonparametric t-test (using Monte Carlo simulation) was used to compare differently enriched pathways between groups. A heat map was created using the R package ‘heatmap3’ function. The non-relevant categories, that is human diseases and functions that are exclusive to eukaryotic organisms, were not presented in the heat map. Total RNA from the liver of selected individuals was extracted using TRIzol reagent (Invitrogen, California, USA), according to the manufacturer's instructions and treated with DNAse (TURBO-DNase, Ambion). Selection of the individuals was based on their microbiome composition (principal coordinates analysis using Bray–Curtis metric to select for individuals with discriminating microbiomes; Figure 4—figure supplement 3). RNA concentration and quality were determined in each sample and samples were equimolarly diluted and sent to the Technion Genome Center (The Technion, Haifa, Israel) for library preparation and single-end sequencing using Illumina HiSeq. The resultant raw short reads were subjected to a filtering and cleaning procedure as follows: the SortMeRNA tool (Kopylova et al., 2012) was used to filter out rRNA, and then the FASTX Toolkit (Gordon and Hannon, 2010) (version 0.0.13.2) was used for (a) trimming read-end nucleotides with quality scores <30 using 'fastq_quality_trimmer' and (b) removing reads with less than 70% base pairs with quality score ≤30 using 'fastq_quality_filter'. The Bowtie2 version 2.1 alignment tool was used to map cleaned reads onto the reference transcriptome of Oreochromis niloticus extracted from the NCBI database (ftp://ftp.ncbi.nlm.nih.gov/genomes/Oreochromis_niloticus/; ASM185804v2) (Supplementary file 1, Table S7). Then, transcript quantification was performed using the expectation-maximization method (RSEM), by estimating maximum likelihood expression levels (Li and Dewey, 2011). Differential expression analysis was performed with the R package ‘DESeq2’ (Love et al., 2014) and transcripts that were more than 2-fold differentially expressed with false discovery rate (FDR)-corrected p < 0.05 (Benjamini and Hochberg, 1995) were considered. The reference transcriptome sequences of O. niloticus were searched against the Danio rerio transcriptome reference (from the NCBI database) for homology identification. The results were further analyzed using the Database for Annotation, Visualization and Integrated Discovery (DAVID) (Huang et al., 2009) to determine the Gene Ontology (GO) and KEGG pathways. Last, to examine host-associated gene expression patterns statistically and to identify genes that are associated with different tolerance groups, we applied the Dufrene–Legendre Indicator Species Analysis (Dufrene and Legendre (19977); function indval with 1000 permutations, package ‘labdsv’ in R), as described in the 'Comparison of gut communities' section. Transcriptome raw sequences are submitted under the accession number SRP164378 (PRJNA419688) in the SRA. Non-parametric tests (Wilcoxon test) and linear mixed-effect models (nlme R package [Bates and Pinheiro, 1998]) were used to assess α-diversity, while Adonis implementation of Permanova (vegan R package [Anderson, 2001]) was used for comparisons between groups in the analysis of β-diversity using the Bray–Curtis distance matrix. LEfSe (Segata et al., 2011) was used to estimate the effect size of each differentially abundant PICRUSt feature and to perform dimension reduction using the Galaxy online tool (http://huttenhower.sph.harvard.edu/galaxy/). CCA (Butts, 2012), was performed between the matrices of the microbiome composition table (OTUs) and the transcriptomic data using principal component analysis. The total fraction of OTU variance accounting for each component by the transcriptomic analysis (expression) variables, through all canonical variates, was calculated. For that, the first four principal components (PCs) from the OTU table were extracted (R prcomp). In addition, the first four expression matrix PCs were extracted using R prcomp. The actual value of the total variance was then compared to that of 1000 random permutations, in which the order of the host line PCs was shuffled. Applied and Environmental Microbiology 71:811–816. Conference on Applied Statistics in Agriculture, 10.4148/2475-7772.1273. American Journal of Physiology-Regulatory, Integrative and Comparative Physiology 275:R905–R912. Applied and Environmental Microbiology 78:7358–7368. American Journal of Physiology. Regulatory, Integrative and Comparative Physiology 284:R153–R163. In: K Horikoshi, editors. Extremophiles Handbook. Japan: Springer. pp. 865–890. International Journal of Current Microbiology and Applied Sciences 2:290–305. Developmental & Comparative Immunology 46:518–529. Environmental Biology of Fishes 99:975–981. Margesin (Ed. ), Psychrophiles: From Biodiversity to Biotechnology. Springer International Publishing, Cham pp. 437–457. Integrative and Comparative Biology 51:691–702. Journal of Experimental Biology 213:912–920. Applied and Environmental Microbiology 82:4441–4452. Letters in Applied Microbiology 46:43–48. Thank you for submitting your article "Support for the hologenome theory as host adaptive capacity shapes and modulates its microbiome response to temperature" for consideration by eLife. Your article has been reviewed by three peer reviewers, and the evaluation has been overseen by a Reviewing Editor and Wendy Garrett as the Senior Editor. The reviewers have opted to remain anonymous. This manuscript by Kokou et al. proposes that Tilapia fish and its microbiome evolve as a unit of selection, based on measured correlations between host genetic makeup and microbiome responses to temperature. The consensus opinion is that, at best, the results claimed by the authors show a relationship (i.e. correlation) between host resistance and microbiome "resilience". This is very interesting, but far from showing support for the hologenome theory. Therefore, the paper needs to be completely rewritten to focus on the experiments actually done and omit the tie-in to the hologenome theory, or transgenerational experiments need to be performed. The authors have measured a microbiome response to temperature within one generation rather than transgenerational changes in the microbiome that would more directly support the hologenome concept of evolution. More generally, it is important to note that the hologenome concept of evolution is an eco-evolutionary hypothesis, while the terms holobiont are hologenome are structural definitions used to define the host-microbiome ecosystem and their genomes. Although multilevel selection is an interesting concept that could apply to host-microbiome associations, extraordinary claims demand extraordinary evidence, and this paper falls short of providing such evidence. In particular, the study shows no data on evolution, only ecological changes in microbiome composition correlated to host genetics. Multi-level selection or coevolution would require transgenerational experiments to establish, not possible in the two month revision window. Given that this paper is not about multilevel selection, presenting that as the main point of this study appears misleading. This is why the paper should be rewritten to say that it is "consistent with the hologenome theory", with this being either a minor component or omitted entirely, or new data supporting evolutionary adaptation effects need to be provided through new experiments. "Interestingly, when fish from both groups were kept under their optimal temperature conditions of 24°C, the sensitive fish exhibited higher microbial diversity (Shannon H') than the resistant ones (Supplementary Figure 2; P = 0.04), suggesting that host adaptive capacity is involved in shaping microbiome composition." What this shows is that the host genetics and physiology (not its adaptive capacity) conditions the composition of the microbiome, at least in this broad statistical sense. This is a strong result which the authors would expand more to provide some insight into processes and or mechanisms. Other claims, however, are only weakly supported if at all. Part of the problem is the use of statistical descriptors that do not capture the multiple dimensions of the data. The authors choose to do the analysis of microbiome composition and susceptibility to temperature at the level of non-informative summary statistics, like diversity indexes. These numbers hide a lot of information about what is going on in the data, and the authors derive conclusions from simple statistical comparisons of diversity distributions that are not well supported. For instance, Figure 2A shows that there are many individuals with similar diversity at 24 and 12°C, but that the 24°C control has a tail of high diversity microbiomes that drives the statistically significant difference between treatment and control. What would happen if we stratify the data by diversity in order to compare individuals with similar diversity indexes in the two families? Would all low-diversity microbiomes behave the same regardless of family? In other words, is the effect we see simply a population average driven by a few more variable individuals, or can it be pinned down to features of the individual microbiome composition? This is an example of how the analysis presented by the authors hides a lot of important information that prevents the reader from getting away with more than a few headlines and no insight into the actual processes. One of the main points of the paper is that the microbiome of resistant individuals is more "resilient" to changes in temperature. However, if diversity is already low in the resistant family and if temperature stress decreases diversity, it stands to reason that diversity will drop less in the resistant family compared to the sensitive one, whose microbiomes still have more microbial taxa "to spare". In other words, drops in diversity may saturate, either because there is a biological lower bound to it or because the index has a non-linear behavior. To assess "resilience" it would be better to work with the set of taxa that are present in all microbiomes (the core), renormalize the data and study fold changes. Again, the problem described in this paragraph stems from the attempt to study changes in high dimensional species composition profiles with single numbers like richness or Shannon diversity. Unfortunately, the taxonomic analysis, which could deal with part of the problem, is done only at the level of shallow clades. For instance, most organisms in Figure 2B are proteobacteria. As the authors must know, this is an incredibly diverse set of microbes. Which proteobacteria? The authors should describe fold-changes in taxa at various taxonomic levels, starting with exact sequence variants. Finally, the functional analysis is strongly biased by taxonomic changes. For example, the statement that the "host selects for taxa with a specific functional landscape that is better suited to cold exposure" is a bold claim lacking supporting evidence, What is shown is simply an enrichment of functions that are more frequently found in proteobacteria. The type of functional categories found have no relationship to anything related to adaptation to low temperatures. Incorporation of David Sloan Wilson's concepts of "selection for" vs. "selection of" traits might be helpful here. In sum, the finding that the microbiome composition is related to the genetic makeup of the host is interesting, but the authors should dig deeper into processes and, if possible, mechanisms. A better statistical analysis that goes beyond simple summary statistics like average richness and diversity and focuses on specific sequence variants and their relationship to the resistance/sensitivity of individual hosts could make the paper much better. The authors should refrain from making grandiose claims about multilevel selection, microbiome resilience, etc., and simply focus on providing a more in-depth analysis of their data. The manuscript was adjusted to focus on the experiments done and new analysis was also added according to the reviewers’ suggestions (see below). In addition, the tie-in to the hologenome concept was omitted from the title and moderated to be more conceptual. "Interestingly, when fish from both groups were kept under their optimal temperature conditions of 24 °C, the sensitive fish exhibited higher microbial diversity (Shannon H') than the resistant ones (Supplementary Figure 2; P = 0.04), suggesting that host adaptive capacity is involved in shaping microbiome composition." Thank you for this comment. According to your suggestion, we further analysed our data to highlight how host genetics/cold tolerance and physiology condition the microbiome. We first performed a similarity test to compare the overall microbiome composition between the cold-resistant and cold-sensitive hosts using Bray-Curtis metric (non-parametric t-test with 1000 Monte Carlo permutations) at the control conditions (24oC) to see potential differences stemming from the genetic selection. We found that the microbiome response within the resistant individuals was more similar compared to the sensitive (Figure 2Ci). We further aimed to get a better insight into the microbiome composition of these host groups, thus we compared the microbiome composition between the cold-resistant and cold-sensitive hosts under any temperature condition; more specifically, we asked whether microbiomes of similar (Shannon H’) diversity were also sharing the same microbiome compositions. To this end, we stratified our data and examined individuals from each host group with similar diversity (see in the next comments for more details). 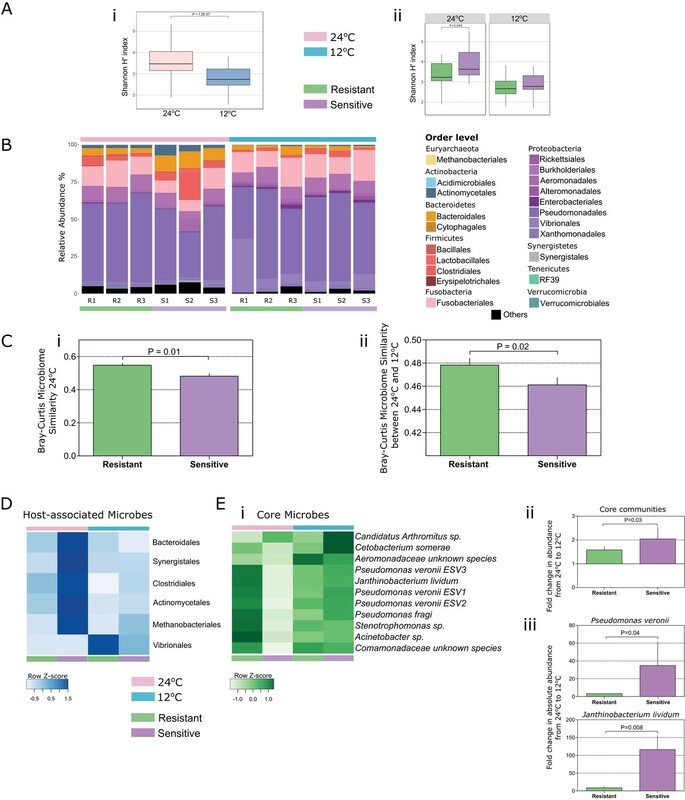 This analysis showed that the microbiomes clustered significantly according to host group/tolerance under any temperature conditions (Figure 2—figure supplement 6), thus suggesting that host genetic background (genetic selection for cold tolerance) has a strong effect on shaping the microbiome composition. We next explored microbial taxa associated to genetic background effects and applied the indicator species analysis (this measure identifies habitat-associated species based on their fidelity and relative abundance in different environments; see Materials and methods). We found different microbes to be associated with the cold-resistant and cold-sensitive fish (Figure 2D), namely Cetobacterium somerae species were mostly enriched in the resistant, while a higher diversity of taxa such as Streptococcus luteciae, Bacteroides fragilis, Prevotella sp., Clostridiaceae and Succinivibrionaceae species were enriched in the sensitive (Table S5 in Supplementary file 1). Interestingly, in the cold conditions we found an enrichment of Vibrionales species in the resistant fish, which have been shown to include several psychrophilic taxa or taxa with adaptations for cold tolerance, thus indicating that cold acclimation of the host may be selecting for specific microbes, with some of them potentially carrying fitness traits for cold tolerance (see below for more information). These results and insights were obtained after we re-analysed all our data using DADA2 (Callahan et al., 2016) as suggested by the reviewers (see below and in the Materials and methods section). Our overall results and figures, generated using the new data at the exact sequence variant level (ESV) originating from DADA2, show the same patterns and conclusions (Figures 2, 3, 4; See also supplementary figures). For instance, Figure 2A shows that there are many individuals with similar diversity at 24 and 12 °C, but that the 24 °C control has a tail of high diversity microbiomes that drives the statistically significant difference between treatment and control. What would happen if we stratify the data by diversity in order to compare individuals with similar diversity indexes in the two families? Would all low-diversity microbiomes behave the same regardless of family? In other words, is the effect we see simply a population average driven by a few more variable individuals, or can it be pinned down to features of the individual microbiome composition? This is an example of how the analysis presented by the authors hides a lot of important information that prevents the reader from getting away with more than a few headlines and no insight into the actual processes. This is a valid point by the reviewers. We thank you for this comment as it allowed us to better present our results and understand our observations. Following this suggestion, we stratified our data by diversity to compare individuals with similar diversity indices. We selected the 10 most extreme values from both temperatures (lowest and highest Shannon H’ diversity; Table S2 in Supplementary file 1) and we performed multivariate and clustering analysis (Two-way Permanova, Tables S3 and S4 in Supplementary file 1; Principal Coordinate Analysis, Figure 2—figure supplement 6). Our results show that, even when we select individuals with similar diversity indices, either high or low, their posterior gut microbiomes cluster significantly according to temperature and host genetics (tolerance) group (Two-way Permanova in Tables S3 and S4 in Supplementary file 1; Figure 2—figure supplement 6). where IndVali j is the Indicator Value of an 'i' species in relation to a 'j' type of site; Specificity ij is the proportion of sites of type 'j' with species 'i', and Fidelity ij is the proportion of the number of individuals (abundance) of species 'i' that are in a 'j' type of site. This analysis showed several ESV features to be host genetics (tolerance)-associated in the low and high diversity microbiomes, as shown in Table S5 in Supplementary file 1. The resistant fish with low diversity microbiomes were more enriched with species of the Vibrionales order, which include taxa that are cold-resistant (Raymond-Bouchard, Whyte, 2017; Townsley et al., 2016), while in the warm temperature, we saw in the high diversity microbiomes an enrichment of Cetobacterium somerae, which has been previously reported in the tilapia gut environment (Tsuchiya et al., 2008; Giatsis et al., 2015; Haygood, Jha, 2016). In the high diversity microbiome of the sensitive group, we observed enrichment of microbes within the Succinivibrionaceae and Clostridiaceae family (unknown species), with the latter being previously reported in several warm water fish species including tilapia, along with Streptococcus luteciae, Bacteroides fragilis and Prevotella species. Looking at host genetics-associated posterior gut microbiome at different taxonomic levels (Figure 2D; Figure 2—figure supplement 8; Table S6 in Supplementary file 1), similarly we found significant enrichment of the Vibrionales order in the cold-resistant fish, while, as mentioned above, a higher microbial order diversity such as Clostridiales, Methanobacteriales and Actinomycetales in the sensitive fish. Altogether, our results suggest that host genetic background shapes the microbiome composition, with some members that potentially carry fitness traits for cold tolerance (i.e. species from the Vibrionales order). Following your suggestion, we assessed the resilience of microbiomes that were present in >50% of the individuals in both temperatures (the core microbiome). We renormalized the data (re-calculated their relative abundance within the core microbiome) and examined the fold changes between the two temperatures within each tolerant group (Figure 2E). Overall, we observed that the fold change of these core microbes was significantly less affected by the temperature change in the resistant fish compared to the sensitive ones (Figure 2Eii). In addition, we designed specific primers in order to measure the absolute numbers for the most abundant and prevalent core taxa (>95% of the individuals; Pseudomonas veronii and Janthinobacterium lividum) and quantified their counts within the samples using quantitative PCR (See in the Materials and methodssubsection “Comparison of gut communities”). Our results agree with the sequencing data, showing a significantly less pronounced effect on the absolute abundances of the core microbes in the gut of resistant fish. These results, from both re-normalization of the core microbes’ abundance and the absolute numbers of some of these core taxa using real-time PCR, support our findings by showing that the changes in the microbiome composition are significantly less pronounced in the resistant fish compared to the sensitive ones (Figure 2E; P < 0.05), thus supporting our hypothesis that host thermal tolerance modulates microbiome response to temperature changes. As suggested by the reviewers, we presented the taxonomic analysis of the microbiome at each taxonomic level (Figure 2B; Figure 2—figure supplement 4), as well as calculated the fold change from control to cold conditions for each group presented in Figure 2—figure supplement 5. In addition, as described above, we performed indicator species analysis for each of the taxonomic levels that showed several host-associated taxonomic groups. As suggested we re-analysed all our data using DADA2 (Callahan et al., 2016) in order to correct any potential sequencing errors and presented our data at the Exact Sequence Variant (ESV) level (100% sequence identity dataset). In addition to using this tool, we took even more stringent approach in which we eliminated sequences present in less than two samples (doubletons) from the 100% sequence ID data sets. This overall analysis is described in the Materials and methods section (subsection “Sequencing of gut microbiome”). Essentially, our overall results and figures, generated using the new ESV data originating from DADA2, show the same patterns and conclusions (Figures 2, 3, 4; See also supplementary figures). As presented in Figure 2A and B, the sensitive animals had a higher diversity of microbial orders compared to the resistant ones, such as species from the families Clostridiaceae, Succinivibrionaceae and from the genera Prevotella and Streptococcus (Figure 2—figure supplement 7-8). These species consistently existed in most of the individuals and show significant association for the sensitive (genetic) group as it emerges from the indval analysis (Figure 2D; 6 in Supplementary file 1 and Figure 2—figure supplement 8). Similarly, we found significant association to the resistant hosts of taxa originating mostly from the Vibrionales order (Figure 2D; Table S6 in Supplementary file 1 and Figure 2—figure supplement 8). Interestingly, taxa from this order has been reported as resistant to low temperatures or isolated from deep sea waters (Bouchard and Whyte, 2017). More specifically, Vibrio cholerae, a naturally occurring species in the freshwater fish gut (Haygood and Jha, 2018), which we found enriched in the resistant fish gut after cold exposure (Figure 2—figure supplement 5F), has been reported to be resistant to low temperatures through adaptation in its physiology (Townsley et al., 2016). Such results support our claims, that host genetic background, but also cold acclimation phenotype is associated with specific microbiome composition, with some of them potentially carrying fitness traits for cold tolerance. Our claim of ‘host selects for taxa with a specific functional landscape that is better suited to cold exposure’ was removed from the text. We additionally discuss and cite David Sloan Wilson's concepts considering our results in the discussion. The taxonomic groups that we found to be enriched in the gut are associated with the hosts and the environmental changes; this also results in the enrichment of functions associated with these taxa, with this not necessarily being connected to cold tolerance. Moreover, to investigate whether there are shared responses between the host and the microbiome after cold exposure that could suggest cold acclimation or cold stress response, we compared the significantly affected KEGG orthologs within the microbiome (Figure 3A) to that of the host transcriptome. Interestingly, we found several functions that were not only shared, but also similarly affected (Figure 3C; Figure 3—figure supplement 1B) between the host and the microbiome. Some of the functions affected were previously reported as key cell metabolism cold-induced adaptations in mice (i.e. down-regulation of PPAR signalling, cytochome 450; Shore et al., 2013) and thus suggesting a potential conserved response to low temperatures. Thank you for this remark. As mentioned above, we now re-analysed our data obtaining a more in-depth taxonomic information at the Exact Sequence Variant level using DADA2. Nonetheless, we further developed our insights on the microbial composition changes due to the host genetic makeup and thermal tolerance. We have shown that when fish from both groups were kept under their optimal temperature conditions of 24oC, the sensitive fish exhibited higher microbial diversity (Shannon H’) than the resistant ones (Figure 2Aii), as well as a higher individual variability. Indeed, when we compared the microbial community structure (β-diversity) of the two groups at these optimal conditions, we found that cold-resistant fish had a higher within-group microbiome similarity compared to the sensitive fish (Figure 2Ci), potentially due to the selection process that resistant fish have been subjected to regarding the cold resistant trait and thus showing a host control on the microbiome composition. We further aimed to get a better insight into the microbiome composition of these host groups. To do so, we first compared the microbiome composition between the cold-resistant and cold sensitive hosts under any temperature condition; more specifically, we asked whether microbiomes of similar (Shannon H’) diversity are also sharing the same microbiome compositions. We stratified our data and examined individuals from each host group with similar Shannon H’ diversity (individuals from each group with the 10 highest or 10 lowest Shannon H’ Diversity values; Table S2 in Supplementary file 1). We found that the individuals from both high- and low-diversity microbiomes (Principal Coordinate Analysis; Figure 2—figure supplement 6) clustered significantly according to the host group (Permanova analysis, Tables S3 and S4 in Supplementary file 1), suggesting that host genetic background (genetic selection for cold tolerance) has a strong effect on shaping the microbiome composition. Our next step was to explore microbial taxa associated to genetic background effects and applied the indicator species analysis (this measure identifies habitat-associated species based on their fidelity and relative abundance in different environments; see above and Materials and methods). This analysis revealed several microbial taxa to be significantly associated with host genetic background, previously described as naturally occurring strains in the tilapia gut (Giatsis et al., 2015; Haygood and Jha, 2018) (Tables S5 and S6 in Supplementary file 1; Figure 2—figure supplement 7-8). Namely, microbial species such as Cetobacterium somerae (Tsuchiya et al., 2008) and species from the Vibrionales order (i.e. Vibrio cholerae; Figure 2—figure supplement 5F), described also as psychrophiles or cold-resistant microbes surviving in different environments (Raymond-Bouchard, Whyte, 2017; Townsley et al., 2016) were enriched in the resistant fish gut, while a higher diversity of taxa was enriched in the sensitive fish gut including Prevotella sp., Streptococcus luteciae, and Bacteroidetes species, as well as species from the Christensenellaceae, Succinivibrionaceae and Clostridiaceae families. Overall, the gut of the sensitive fish was more diverse in microbial taxa and more variable between individuals during the warm conditions compared to the resistant fish, which could potentially stem from the fact that the resistant fish have been subjected to a selection process towards the cold resistant trait, while sensitive ones still contain higher genetic variability, however this still remains to be evaluated in future experiments. Altogether, our results suggest that host genetic background shapes the microbiome composition by selecting for specific microbes, with some of them potentially carrying fitness traits for cold tolerance. Finally, as host fish were specifically selected according to their thermal tolerance, and our findings indicated that temperature and host genetic background affect the fish gut microbiome, we further asked whether the microbiome's response to temperature stress is also affected by its host's tolerance. 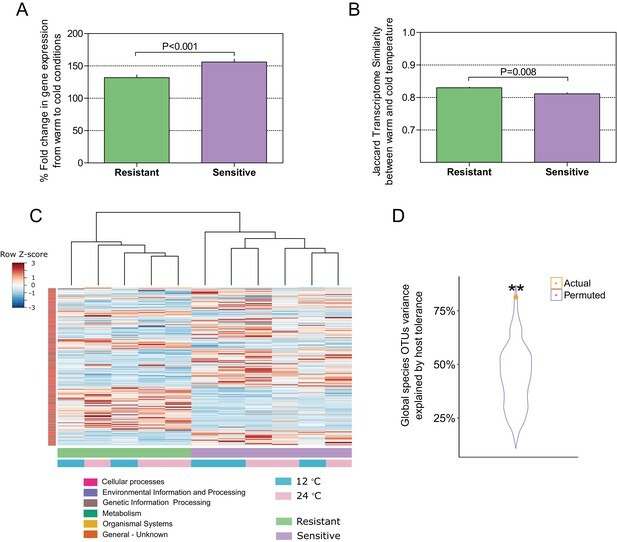 When exposed to the cold temperature of 12oC, both resistant and sensitive hosts exhibited a decrease in their microbiome diversity and richness (Figure 2A; Figure 2—figure supplement 3), as well as changes in its composition (Figure 2B; Figure 2—figure supplement 4-5). However, when we compared the β-diversity within each of these host groups in relation to temperature change, we found that after exposure to the stressful low-temperature conditions, the microbiomes of cold-resistant families were less affected than those of sensitive ones (Figure 2Cii). More specifically, when we compared the similarity of the microbial compositions between 24oC and 12oC, we found it to be significantly higher in the resistant families than in the sensitive ones, showing a stronger effect of temperature change in the sensitive fish (Figure 2Cii). We next asked whether this differential response to temperature of the microbiome in the two host groups also applies to microbes that are shared between the two host groups. To this end, we assessed the microbiome resilience in 11 selected taxa that were present in >50% of the individuals from each temperature (core microbiome). After renormalizing the core microbes abundance (expressed as percentage within the core microbiome community; Figure 2E), we evaluated the fold changes in their abundance from 24oC to 12oC in the cold-resistant and cold-sensitive fish. Similar to the overall microbiome response (Figure 2Cii), the fold changes in the relative abundance of the core microbiome in the resistant fish was significantly lower that the sensitive ones (Figure 2Eii). In addition, we further designed specific primers in order to measure the absolute copy numbers for the two most abundant and prevalent core taxa within both host groups and quantified their abundance using quantitative PCR (see Materials and methods). Our results were in agreement with the sequencing data (Figure 2Ei, ii), showing a significantly less pronounced effect of the temperature on the abundance of the core microbes in the gut of the resistant fish compared to the sensitive ones (Figure 2Eiii). This means that the sensitivity of the shared-core microbes to cold temperatures was higher in the sensitive fish and thus supporting our hypothesis that host thermal tolerance modulates its microbiome response to temperature changes. We would like to thank the editors and the reviewers for their valuable comments that helped to improve our manuscript. The research described here was supported by grants from the European Research Council under the European Union’s Horizon 2020 research and innovation program (grant agreement no. 640384), the Israel Science Foundation (grant no. 1313/13), and the Chief Scientist of the Ministry of Agriculture and Rural Development (grant no. 863–0045). Animal experimentation: This study was approved by the Agricultural Research Organization Committee for Ethics in Using Experimental Animals and was carried out in compliance with the current laws governing biological research in Israel (Approval number: 146/09IL). © 2018, Kokou et al.